Imagine if Wizards of the Coast told us exactly how many packs of Dragons of Tarkir had been sold so far. We know how the cards are distributed, so with an accurate pack count, we could determine precisely how many Dragonlord Atarkas there are in the wild and compare that with the numbers for Fate Reforged and the amount of Monastery Mentors in existence. 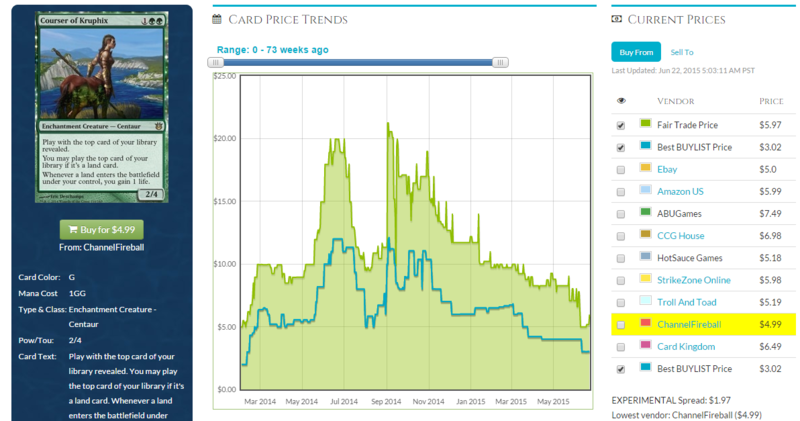 Armed with that info, it would be really easy to pinpoint where cards were in short supply and buy accordingly. Unfortunately, Wizards does not publicize that information, or at least not very often. We get hints about proportions (“X is the best-selling set of all time!”) every so often, but ultimately, we’re left to determine supply based on anecdotal data and broad assumptions. Sure, it’s pretty easy to say there’s a lot more Innistrad out in the wild than Lorwyn, but by how much? We don’t really know, and can’t with the amount of information we have at our disposal. And things get murkier when we start comparing recent sets. How does Dragons of Tarkir compare with Journey into Nyx? Or Dragon’s Maze? We can broadly assume that Dragon’s Maze was unpopular so there’s probably far fewer Voice of Resurgences out there than there are Dragonlord Ojutais, but it’s all guesstimating—we are just not in a position to know what the actual card counts are on these cards, or any cards for that matter. So while the pattern over the last decade or so has been one of extreme growth (and thus ever-increasing amounts of supply), we know the proportions between set printings in only the broadest terms. Again using Dragon’s Maze as an example: we know it was an unpopular set, but we don’t have the numbers as to just how badly it actually performed. If we did, we might find that Voice of Resurgence is greatly over- or underpriced when we consider the actual number of copies out there. Way back in 2013, Anthony Capece, a former writer for BrainstormBrewery.com, did some very important work for the community in shining a light on some of these supply issues. Those articles, “Rare is the New Uncommon” and “Size Matters,” should be required reading for every single MTG financier, so if you haven’t read them before (or even if it’s just been a while), click those links. They’ll open in a new tab and everything, so you don’t even have to stop reading here. Anthony did some great investigative work to come to rough estimates on supply of new sets compared to old ones, but we still don’t have the exact numbers. However, just like Magic is a game of imperfect information, so is MTG finance, and our job is to take action based on the information that we do have available. Let’s compare two very different but similarly priced (at time of writing) cards: Courser of Kruphix and Gilded Lotus. Courser derives most of its value from Standard play, though that value is tapering off fast from a high of over $20 to the current price of $6. The card has seen a little bit of Modern action, as well, but doesn’t make the MTG Goldfish list of the top 50 creatures in the format. To top it off, Courser isn’t exactly undesirable in the most popular casual formats, Commander and Cube. Despite being good outside of Standard, most of Courser’s historic price comes from Standard demand, where it has been a complete staple and almost always a four-of. The price loss over the last several months is almost certainly attributable to the upcoming rotation, and we may still lose some more off the price by the time we lose Theros block from Standard. Alternatively, we have Gilded Lotus, which saw no Standard play after it was last reprinted in M13. The card derives all of its sharply increasing value from casual play, as there’s a copy in most cubes and in most Commander decks, but nary a single competitive deck wants something like this (cue someone linking to a Vintage deck that just needs to Tinker out Gilded Lotus for some reason). I love data, but unfortunately, we just don’t have enough of it to determine exactly why these cards are virtually the same price despite such different demand profiles. 35% of Standard players need four copies of this card for a Standard deck (reasoning: MTG Goldfish cites Courser of Kruphix as being a 3.8-of in 35.94 percent of Standard decks). 20% of Commander players need one copy for their decks (reasoning: this is good in any green deck, and theoretically, one-fifth of decks in Magic are of a particular color). 90% of cubes need one copy (reasoning: some cubes have special restrictions, but this is good enough to warrant an include in most lists). 5% of Modern players need or want to have available four copies for a Modern deck (reasoning: it’s hardly a staple in five-percent of decks, but some players need to have everything). The Invisibles playing wild card. 90% of Commander players need one copy for their decks (reasoning: some aggressive decks might not want this, but it’s a colorless fixer that ramps to giant fatties and can go in literally any deck). Again, these are just numbers I pulled out of thin air—they’re here only for illustration’s sake. If these numbers were accurate, do you think we could use them to determine the total number of active players in each format? I hope you’re saying no, because these numbers are not accounting for the mystery I discussed during the first part of this article: how many copies of each card is actually in existence. We just can’t fill in enough of the variables to fully solve the equation. This is why no speculation target is ever 100-percent safe: we (the MTG community) do not have enough information to know for sure that there is or is not enough of one particular card to satisfy the demand from all players who might want one or more copies for whatever reason. Still, I think the exercise of going through where a card’s demand is coming from can really help to streamline one’s thought process regarding a card one is considering buying. Several MTGPrice writers have (rightly) been harping on three major targets from Khans of Tarkir block, so let’s consider where the demand might come from for each of these moving forward. I have not bought in to Siege Rhino, but the card is an extremely interesting case. Normally, a three-color card has very limited upside, as only a select few decks can play it, but we’ve seen Standard and Modern decks designed essentially because this card is powerful enough to warrant it. Still, there’s pretty much a maximum of one deck in Standard and one deck in Modern that wants this card, and even if those comprise a huge part of each metagame, there’s not any cross-deck applicability to really keep Rhino’s price up. Further adding to my concerns is that this isn’t going to be in hardly any Commander decks or cubes, given its limited upside in the 100-card battlecruiser format and the limited space for three-color cards in most custom drafting environments. Just piling on to my concerns, it’s a rare from a large fall set, and if you read Anthony’s articles that I linked above, you’ll know why that’s bad. In summary, when I started writing this section, I thought that Siege Rhino was a fine pickup (if not as good as others), but now that I’m finished, I don’t want to be buying into this at $4. Yes, it’s good enough to warrant decks designed around it, but the assumed supply is as high as cards get and its applicability is highly specific, despite its power level. Tasigur, on the other hand, is awesome. Delve cards aren’t automatic four-ofs, but even if Tasigur only sees play as a three-of, he’s wanted in Legacy, Modern, Standard, Commander, and Cube, and has plenty of applicability in all kinds of decks from aggro to control. Again, he suffers from being rare and not mythic, but in this case, we’re looking at a small set that didn’t sell for nearly as long as Siege Rhino’s Khans of Tarkir. It’s easy to envision much more demand for Tasigur than for Siege Rhino, and it’s also fair to assume the supply is lower. Considering it’s already begun its ascent, the MTG finance community seems to agree. See the Unwritten, on the other hand, has gone down since its initial surge in popularity in response to the announcement of Battle for Zendikar. 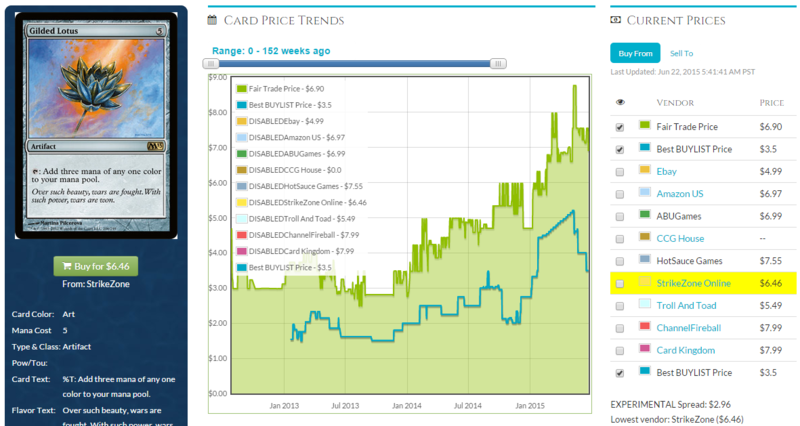 It’s now just above $3, and it has a much different demand profile than Siege Rhino or Tasigur. With See the Unwritten, we’re speculating not on current playability in Standard or eternal formats, but on future playability with the assumed Eldrazi coming in BFZ. Initially, this seems riskier than something like Siege Rhino, and maybe it is. I strongly believe there will be Eldrazi in BFZ. The Standard Eldrazi deck might be good, but even if it’s not, this is a mythic and people will want to try out the deck. The card has enough applicability in Commander that I expect it to grow slowly over time regardless, so in the worst case, it becomes a long-term spec instead of a short-term one. If See the Unwritten was a rare, I wouldn’t give it a second glance at this price, but mythics can do crazy things, as there’s far fewer of them compared to their rare counterparts. When observing exactly who might be demanding See the Unwritten, it has the smallest group of any of the cards I’ve discussed in this article, but the lower supply due to its mythic-ness makes me much more willing to take a risk on it. Remember, a strategy doesn’t have to be good for a spec to pay out. 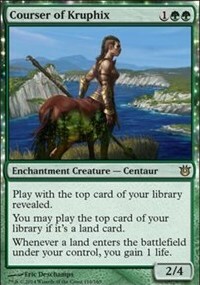 In a perfect world, we would know the exact number of Siege Rhinos, Tasigurs, and See the Unwrittens in existence, and we would also know exactly how many active players each format has. 40% of two-colour decks are Green and 60% of three-colour decks are Green. Assuming demand across the colours is equal.